Boulder resident, Jane Enterline recently bought a new car. Her next door neighbor, Graham Hill, mentioned the idea of sharing that car with her entire neighborhood. She fell in love with the idea, so now her new shiny, fuel-efficient, red Honda Fit is conveniently placed outside her Whittier Neighborhood home, and as part of the eGo CarShare fleet, she won’t have to pay for insurance, maintenance or even gas. 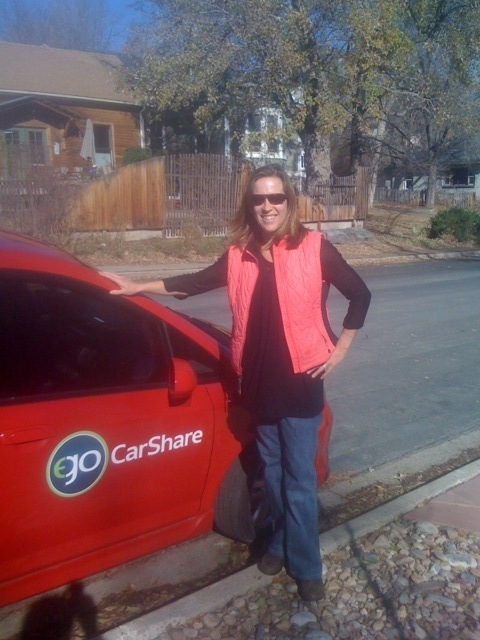 This is Peer-to-Peer (P2P) CarSharing and, though referred to as a new phenomenon, has been going on in Boulder since 1997. P2P asks the question, “Why so many cars?” Peer-to-Peer CarSharing has the potential to change the standard ratio (one car for every person) to neighbors sharing cars with neighbors. Imagine entire neighborhoods reclaiming the public spaces we now reserve for automobiles by significantly reducing the number of vehicles that remain parked, and unused, 22 hours out of every day. The traditional concept of one car, one owner is about to become an outdated paradigm. As serial Internet entrepreneur, Lisa Gansky, highlights in her recent book The Mesh, “We’re moving from an economy and lifestyle where access trumps ownership.” Indeed, Boulder’s soon-to-be launched Community Tool Library and upcoming Bike Share program further illustrate this trend. “I was going to buy a car anyway, but when this option became known, I thought it was perfect for my family,” explained Enterline. “I ride my bike a lot, plus I have an Eco Pass, so sharing our car and still having easy access to it made this an easy decision. I think more people will be willing to buy a car and place it in front of their house for others to use in exchange for no operating costs. When I first looked into carsharing, I noticed that the closest car was about 9 blocks away. By adding my car to the eGo fleet I can unload my groceries in front of my house, while providing a beneficial resource to my neighbors,” said Enterline. In 2009, the average annual cost of owning a car was $8,487 per 15,000 miles. That’s $707 per month. This cost is seldom considered in purchasing decisions. Sharing will become the new norm as we move away from hyper consumerism and re-invent ourselves and our society. As Gansky put it “With all of our ability to connect to each other and the physical world, this is the precise moment when sharing our things could be convenient, relatively inexpensive, and painless.” For now, Boulder residents can easily share their cars making us wealthier with easy and cost effective access. Did Aristotle see this coming? Mom, Why Can’t We Play Ball at Casey? Why Does My Neighborhood Look the Way It Looks Today? Previous Topic: Power to the People!